Nova Scotia pioneered steel-making in Canada, and led in output and innovation during the industry’s first 50 years when expanding cities, industries, and transportation were demanding steel. Blessed with coking coal and access to iron ore, Nova Scotia produced Canada’s first steel (1870) and poured ingots (1883). Among Canada’s big four steel plants, two mighty Nova Scotia companies were producing 50% of Canada’s steel by 1914, and surpassed all in shell manufacture during World War I. A 1921 merger created one corporation comprising coal and iron mines, limestone quarries, a steel plant, forging and finishing mills, a rail car plant, and transport system, headquartered in Sydney. Between wars, steel demand slumped, but surged during World War II, when Nova Scotia produced 43% of Canadian steel, including shells and the celebrated big guns. 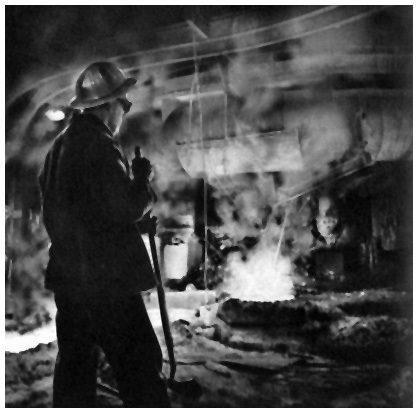 Post-war, even as the country’s largest forgings were being done in Nova Scotia, political, market, transportation, and technological factors brought about the demise (2001) of steel-making in Nova Scotia.